Here’s a fascinating insight into Beeboid thinking concerning Iran. The headline announces that “Iran claiming victory despite sanctions” and it covers the Mullahs response to the effete sanctions, passed by the UN Security Council on Monday, which extend the two previous ineffectual tranches of sanctions aimed at tightening the economic and trade squeeze on Iran. The BBC asks Mark Fitzpatrick, a nuclear proliferation expert at the International Institute for Strategic Studies in London, for his view and he suggests that the UN Security Council has failed to achieve its stated objectives. The BBC goes on to quote the Supreme Tyrant Ali Khamenei declaring that Iran had “honestly and seriously achieved a great victory”, for which he praised the country’s political leadership. 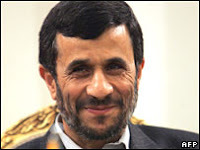 By way of balance, ahem, the BBC then allows well know peace-maker Iranians President Mahmoud Ahmadinejad to weight in with his take: “Everyone has understood that Iran is the number one power in the world. Today the name of Iran means a firm punch in the teeth of the powerful… ” I’m guessing you know who he is referring to – and so do Al Beeb. They just love anyone who hates the US, eh? The bit that really gets me is when the BBC author of this report, Paul Reynolds then editorialises that “it remains unclear as to what Iran can do with its “victory”. Wiping Israel “off the map” would appear to be the stated objective – has Paul forgotten what Ahmaddie said a while back? It’s all about finishing what Hitler started for the Mad Mullahs – and yet the BBC seem perplexed about it all! Maybe they believe, along with the Fabulous Baker boys stateside, that Iran can be a force for stability in the region – once Israel is gone of course?